Fame. Money. True Love. Multiple orgasms. We’re all searching for something. Whether we can find it in Amsterdam or not is a different story. My quest is a little simpler. 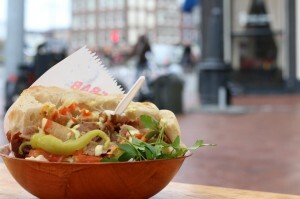 I’m searching for Amsterdam’s best broodje doner. The ubiquitous hand-held kebab is sold in hundreds of snackbars across the city, thanks to Amsterdam’s 43,000-strong Turkish population. A quick google search points to one place out of the crowd: Leeman Doner in De Pijp. Consistent 5-star reviews, low prices, and queues out the door every day of the week. Sounds like the search could be over before it’s even started. I hop on my bike, stomach rumbling, hoping Leeman will live up to my expectations. You see, for me this is a very personal journey. Doner kebabs in Ireland are a different class of food altogether. Greasy and heavy, made with meat of dubious origin, an Irish kebab the kind of snack that’s only appreciated after heavy drinking. And like most things that happen after heavy drinking, it’s a choice that’s regretted the following day. Not so at Leeman. I arrive at noon to an already sizeable queue. It’s a family-run operation, and the small team work with military precision, taking orders and assembling the broodjes at lightning speed. I pay my €2.50 and get in line. The meat is melt-in-the-mouth tender, served in a freshly baked Turkish bun with just the right mix of cool garlic sauce and fiery sambal. There aren’t many topping options here though. Lettuce, onions, or both, that’s about it. A drawback for some, but as a kebab purist I couldn’t care less. Before I can think of anything else to write about my food, it’s gone. I devoured it. I’m tempted to call the race right now, order another broodje doner, and declare Leeman the undisputed heavyweight champion of discount snacking. But I remember a tip from a friend. Apparently in the Dappermarkt there’s a stall called Beste Doner run by a man named Hasan. And apparently Hasan’s doner blows Leeman’s out of the water. With renewed purpose, I hit the road again. The journey pays off. At €4.50 Hasan’s kebab is nearly twice as expensive as Leeman’s, but it’s a work of art. If Leeman’s team work like an assembly line, Hasan’s crew are master craftsmen. The broodje is meticulously prepared, and served with an array of extras – down to the sprig of parsley and spicy pickled pepper balanced on top. And if Leeman doner tastes orgasmic, then this can only be described as an earth-shaking, tantric experience. It’s the best kebab I’ve ever eaten. I’m blown away by it. The bread is baked fresh on site, like in Leeman Doner, but somehow manages to be fresher. The meat is succulent and deliciously spiced, and the sauces and toppings complement it perfectly. Afterwards I’m licking my fingers, savoring every last taste of my meal. 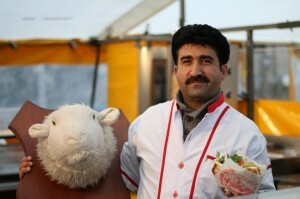 Hasan’s meat was included in a countrywide quality test on Dutch television in 2010. The test found that his was the only Kebab tested that was actually 100% lamb as advertised. Some others were even passing off pure pork as lamb. Definitely not Halal. I think I’ve found Amsterdam’s best broodje doner, but the fact that my stomach is completely fine after having two within an hour is testament to the quality of this city’s kebabs overall. A doner without an upset stomach in Ireland is unheard of. I decide to end my quest after Hasan’s broodje. Even if there is a better broodje doner out there, three in one day is pushing things a little. I hop on my bike one more time, not to test another kebab, but to grab a bottle of water and an Albert Heijn salad for dinner.